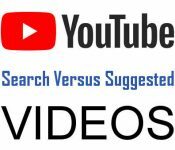 YouTube publishers who look at the “suggested videos” report in their analytics may find some useful insights about their titles. YouTube clearly rewards video quality more than video quantity. That reward system differs from what Google does with search.